Ahhh, that was a nice, long rest, wasn’t it? I feel refreshed, energized, motivated…to blog again, that is. Sorry for the long delay…Since my Oly tri in September, life has been full: family, projects around the house, and yes, goal-setting and training for the next race. I’m the Parent of a Kindergartener! 1. How long until our sun turns into a supernova? 2. How much cheese can you eat before you have a heart attack? All pretty reasonable questions, though none quite as wonderful as the one he asked me a year or two ago: “Mommy, what do the actors do when we press ‘pause’ on the remote control?” I laugh every time I envision a crew of tiny people inside our TV standing around waiting for my son to press “play” again. Trying to find answers must count as some kind of training for my brain. I swear I’ve done speedwork on the track lately that was less exhausting than a 20-minute conversation with my son! Still, I’m loving this stage of his childhood, where his creativity and curiosity are expanding so quickly, but his little body still fits perfectly next to mine when he crawls into bed for a snuggle on Saturday morning. I’m Training for a Half-Marathon! I’m just hoping my body’s revolving display of nagging aches and pains (Left foot! Right knee! Left hip! Upper back!) doesn’t progress to anything steady and debilitating. With a little luck, February 16th will find me CRUSHING my half-marathon PR and nailing my goal pace! Either way, I’m feeling pretty good about the way I’m running right now. And, here I am again. Today was the last run of the peak week of training for my HM. I’m proud to say I met or beat the prescribed pace for every tempo run, track workout, and long run I’ve done. I had weekly mileage totals that were way higher than I’ve ever had in the past, and all on 3 days a week of running! I cross-trained on the bike and in the pool, too, which was a nice break from the long run workouts. At this point, I don’t even really feel that much pressure to nail my goal pace for the half. I’ll run hard if I feel like it, or back off if it feels like too much. The real victory I’m celebrating is having the self-discipline to push myself through mile repeats on tired legs, or an 8-mile tempo run when my stomach was cramping…or just getting myself out the door for a long run on a cold day when I could have stayed in my warm house. So send me some happy thoughts on February 16th, if you think about it, but rest assured that I will be having fun no matter what. After all, the hardest part of my race is already finished. 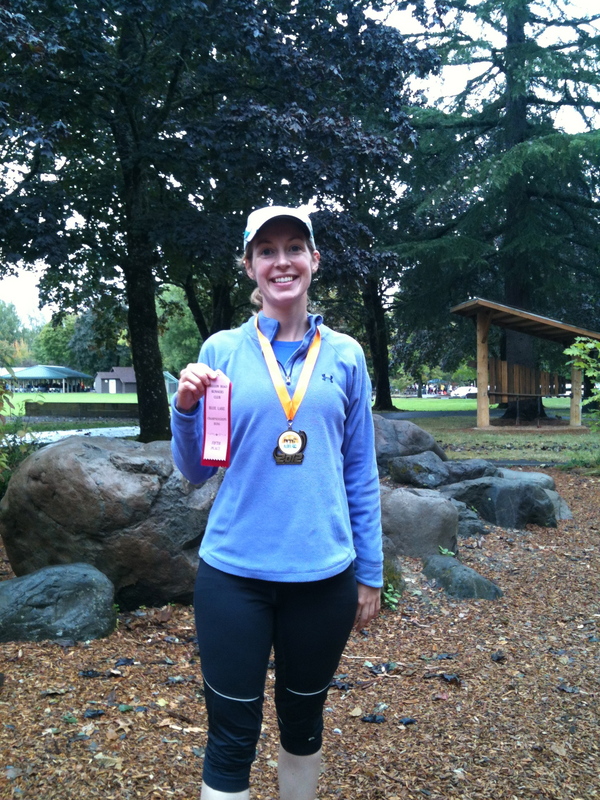 In the interest of pushing myself a little, and in the name of tradition, I ran the Blue Lake 5K again this year. It was the first race I did when I started my triathlon journey over two years ago, and last year it was a fun way to cap off my tri season. This year, it was really a test of where I was in my injury rehabilitation program. I ran the whole thing at a pretty steady, hard effort…and finished over two minutes slower than last year. Oh, well…I already knew my fitness took hit with my 4-month layoff. Still, this time I was almost a minute faster than the first time I ran this race, so at least I’m not back to square one! One way to take home an age-group award? Pick a race with a really small field! This guy ran a good race, too. 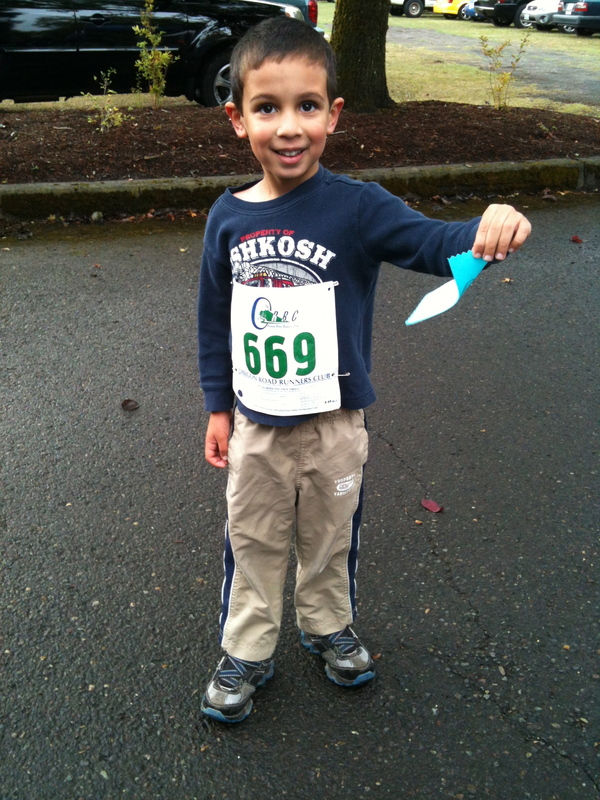 5 minutes for the half-mile kids’ run! I had an absolutely lovely 4.4-mile run last week, so I’m thinking of setting my sights on a Thanksgiving Day 10K. That should give me a little motivation to keep working on those longer runs…And maybe it will silence my inner critic, too! Twitter: It’s Like My Blog, But Updated at Least Weekly!